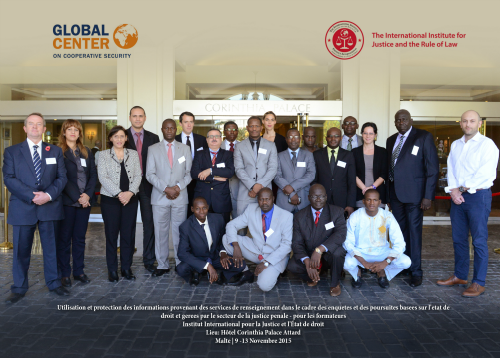 In partnership with the International Institute for Justice and the Rule of Law (IIJ), the Global Center conducted a 5-day pilot training course on “Using and Protecting Intelligence in Criminal Justice-led Investigations and Prosecutions.” The course was delivered by a multinational team of experienced judicial and law enforcement trainers, led by Amicus Legal Consultants, to a diverse group of criminal justice and intelligence specialists from Burkina Faso, Chad, Cameroon, Mali, Niger, and Tunisia. The pilot course, offered in English and French, focused on legal and practical issues that arise between safeguarding the integrity and confidentiality of intelligence and its sources in the criminal process, while, at the same time, protecting due process and fair trial rights of the accused in a court of law. The course is intended to elicit constructive feedback from participating specialists on further developing the curricula to cater to the needs of practitioners in their respective jurisdictions, as well as for future deliveries of the course within the IIJ’s core curriculum.